An image transform converts an image from one domain to another. Images are usually acquired and displayed in the spatial domain, in which adjacent pixels represent adjacent parts of the scene. However, images can also be acquired in other domains, such as the frequency domain in which adjacent pixels represent adjacent frequency components, or the Hough domain in which adjacent pixels represent adjacent projection angles and radial distances. Viewing and processing an image in nonspatial domains can enable the identification of features that may not be as easily detected in the spatial domain. Learn about the Fourier transform and some of its applications in image processing, particularly in image filtering. 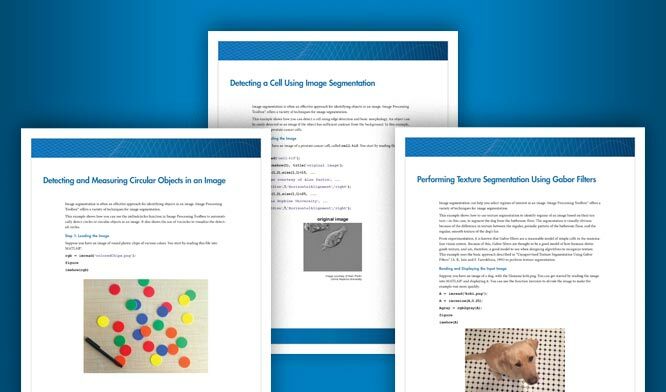 Learn about the discrete cosine transform (DCT) of an image and its applications, particularly in image compression. The Hough transform detects lines in an image, including lines tilted at arbitrary angles from vertical and horizontal. The Hough transform tends to be quick, but can exhibit artifacts. The Radon transform detects lines in an image, including lines tilted at arbitrary angles from vertical and horizontal. The Radon transform tends to be more accurate at the cost of longer computation time. The inverse Radon transform reconstructs an image from a set of parallel-beam projection data across many projection angles. Use fan-beam projection and reconstruction when projections of an image are acquired along paths radiating from a point source. Medical tomography is a common application of fan-beam projection. Form parallel-beam and fan-beam projections from a head phantom image, and how to reconstruct the image using radon and fan-beam transforms. 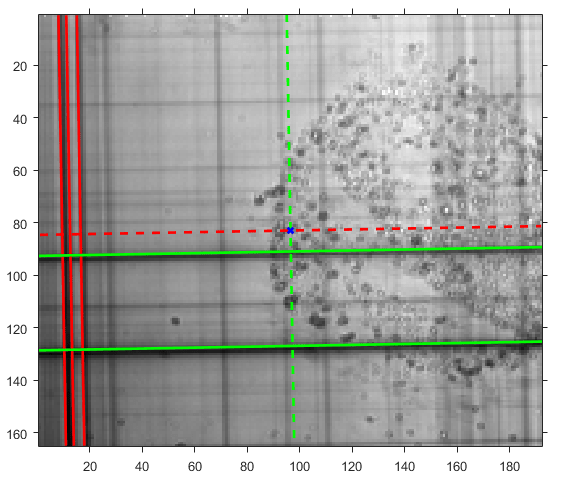 Detect lines and identify the strongest lines in an image using the Radon transform.